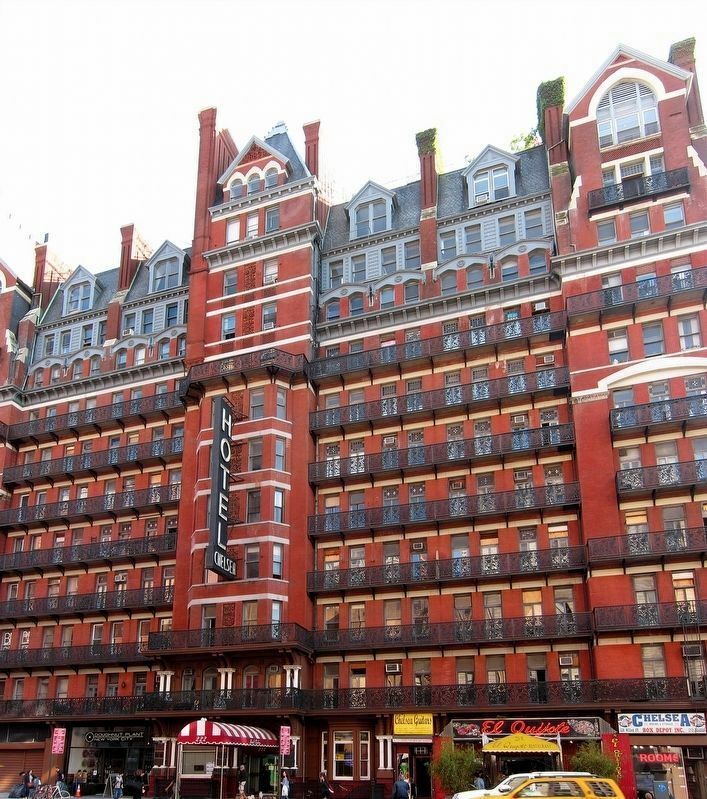 Designed by Hubert & Pirrson, the Chelsea was opened in 1884 as one of the City's earliest cooperative apartment houses. It became a hotel about 1905. The florid cast iron balconies were made by the firm of J.B. and J.M. Cornell. Artists and writers who have lived here include Arthur B. Davies, James T. Ferrell, Robert Flaherty, O. Henry, John Sloan, Dylan Thomas, and Thomas Wolfe. Erected 1962 by New York Community Trust. Location. 40° 44.668′ N, 73° 59.809′ W. Marker is in New York, New York, in New York County. Marker is on West 23rd Street west of 7th Avenue, on the left when traveling west. Touch for map. 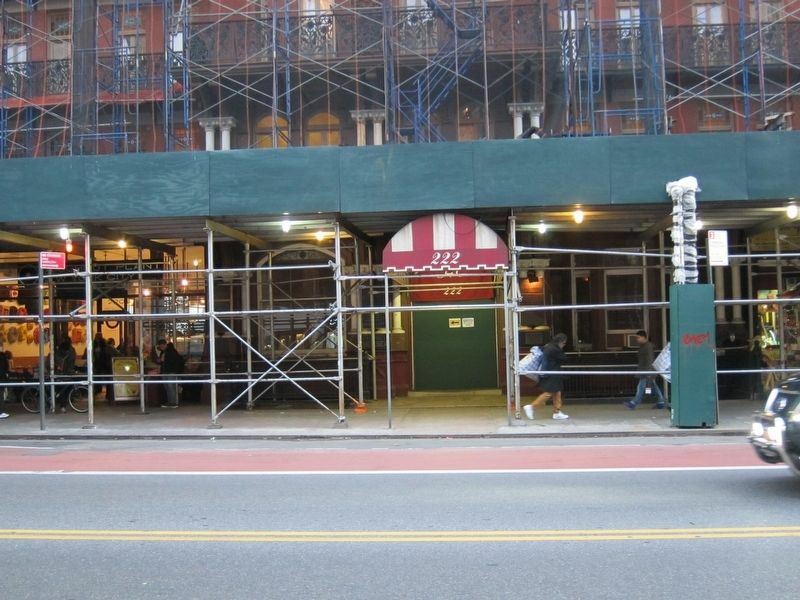 Marker is at or near this postal address: 222 West 23rd Street, New York NY 10011, United States of America. Touch for directions. Other nearby markers. At least 8 other markers are within walking distance of this marker. Sir Arthur C. Clarke (here, next to this marker); Shirley Clarke (here, next to this marker); Gay Men's Health Crisis (approx. 0.2 miles away); Masonic Hall (approx. ¼ mile away); Chelsea Historic District (approx. 0.3 miles away); James N. Wells Mansion - 1835 (approx. 0.3 miles away); David Dubinsky (approx. 0.3 miles away); Clement Clarke Moore (approx. 0.3 miles away). Touch for a list and map of all markers in New York. 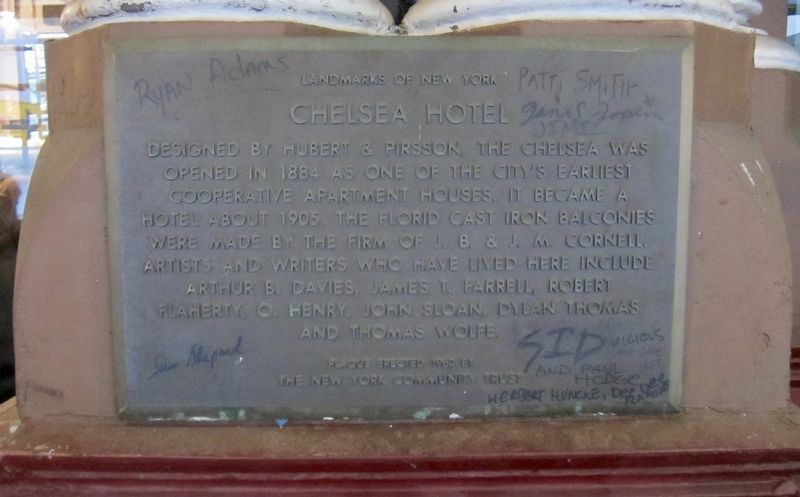 As noted on the marker, the Chelsea has had a number of noteworthy residents. In addition to those mentioned thereon, a number of other residents have each received their own historical marker. 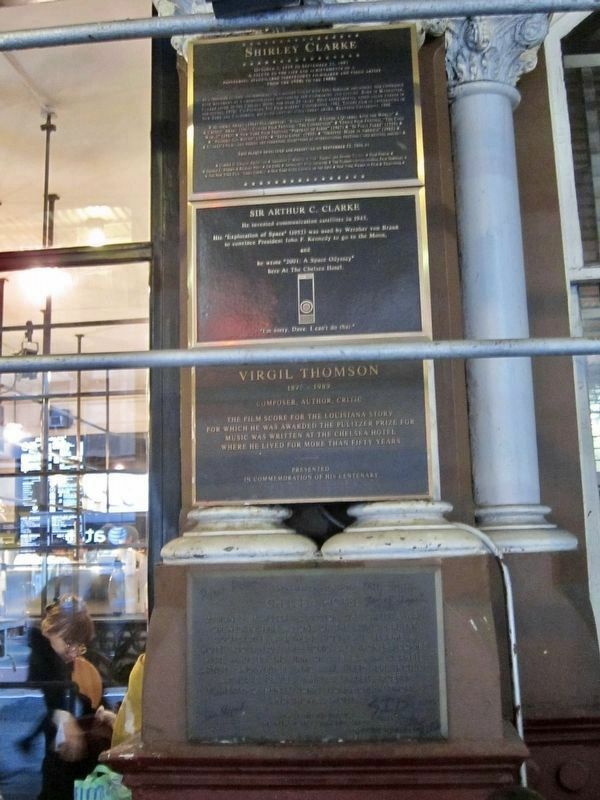 In this photo, above the Chelsea marker are historical markers for Shirley Clarke, Arthur C. Clarke, and Virgil Thompson. Each has (or will have) its own entry in the database. 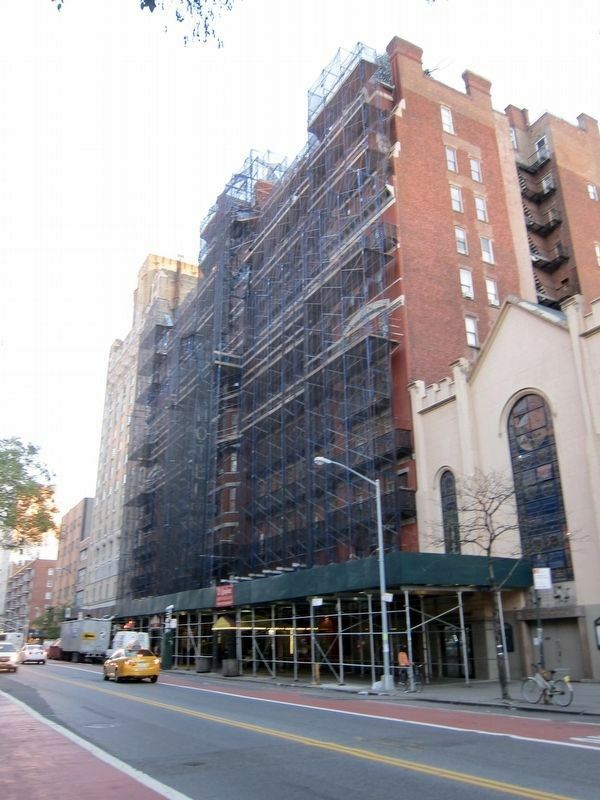 The Chelsea is currently undergoing renovations, hence the scaffolding makes it difficult to see the markers. However, were visibility a bit better, the 4 markers visible in Photo 2 would be visible here to the left of the window that is just to the left of the entrance. In addition to those, 2 more would be visible on the right side of that same window, and an additional 3 would be visible to the right of the entrance. 4. 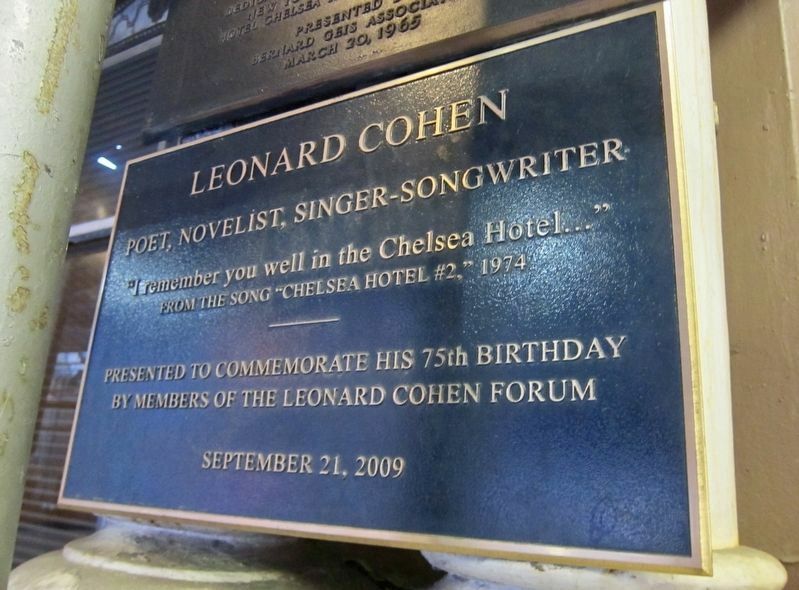 Chelsea Hotel Marker - Still Wider View, Looking East on W. 23rd St.
More. Search the internet for Chelsea Hotel. Credits. This page was last revised on December 21, 2017. This page originally submitted on December 21, 2017, by Andrew Ruppenstein of Sacramento, California. This page has been viewed 93 times since then and 5 times this year. Photos: 1, 2, 3, 4, 5, 6. submitted on December 21, 2017, by Andrew Ruppenstein of Sacramento, California.